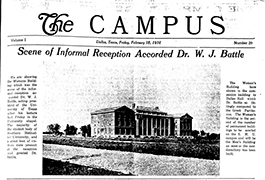 Beginning a tradition that has thrived for nearly a century, Southern Methodist University students published a campus newspaper the first month the university opened. The S.M.U. Times’ premiere issue debuted September 11, 1915 — 11 days before school started. Articles in that first issue included the following: "Four Hundred Business Men Helping Dallas Raise $200,000 for Student’s Dormitory at S. 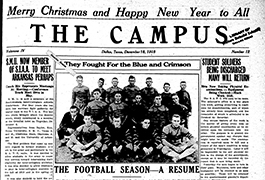 M.U.," "Faculty Reception Attended by 2,000 of Dallas Citizens," "Many Stars to be on Football Squad," and more. In an effort to make early editions of the campus newspapers available online, Southern Methodist University Archives has initiated a project to digitize these student publications. So far, all issues from 1915-1991 have been digitized. 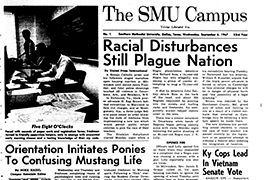 As funding becomes available, plans exist to continue digitization of the SMU student newspapers up to 2000. Digital files of the newspapers created by the Student Media Company for 2010 through 2018 were also donated to the SMU Archives when the Student Media Company became defunct, and those newspapers are also available in this collection. 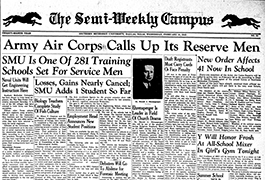 Presently the student newspapers are available on microfilm in Fondren Library for the dates 1915-May 2009. In 1998, the Daily Campus became digital and a print paper and is archived online from 2010-2017. The newspapers are indexed from Fall 1915 - 2002. These indices are available in Fondren Library (call number LH1.S66 S65) and in Fondren Library’s Centennial Reading Room. After 2002, the Daily Campus was no longer indexed since it was stored online and easily searchable. 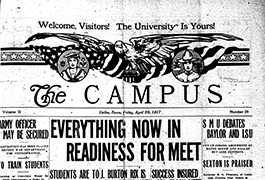 In addition the Southern Methodist University Archives has a small collection of unbound newspapers. A finding aid that describes these issues is available. 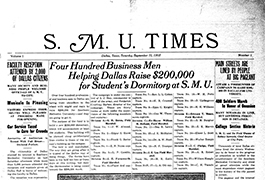 The Southern Methodist University Students’ Publishing Company, incorporated in 1930, established a free press. The company, now called the Student Media Company, Inc., is a non-profit Texas corporation that operates independently from SMU. It publishes The Daily Campus and Rotunda yearbook, both of which are edited by students. KPNI Radio (formerly KSMU) was supported and owned by the Student Media Company from 1964-1989 and from 1995-2003. It also publishes the Directory of Students, Staff, and Faculty. Over the years, the frequency of the newspaper has varied from once or twice a week to daily. The way the paper has been produced has changed, too, as technology evolved. 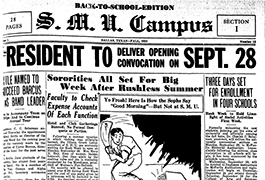 In 1939, this silent movie explains how the Semi-Weekly Campus went to press. The Daily Campus continues today online only as a website run by the Journalism department. The Campus ceased print publication in May, 2018. Weekend issues of The Daily Campus were published with the title The Daily Campus Weekender from 1976 to 1979. Summer issues of The Daily Campus were published with the title The Summer Campus from 1970 to 1983. Although the name of the campus newspaper has changed several times, its mission has remained steadfast: "To operate superior, responsive student media in a learning environment dedicated to excellence, student freedom of expression and sound business practices appropriate to a university." The funding for the digitization and creation of metadata for this collection has been provided by grants from the Friends of the SMU Libraries since 2010. Thanks go to Cindy Boeke, Digital Collections Developer, for her oversight and collaboration on this project, and to the staff of the Norwick Center for Digital Solutions for the creation of metadata. Northern Micrographics creates digital files from our microfilm masters. Items in SMU Libraries digital collections are digitized following the nCDS Digitization Guidelines and Procedures. Digital collections are created under the guidelines of the nCDS Filenaming, Workflow, and Metadata Guidelines, or through specialized metadata profiles tailored for the collection. All materials published on this web site, Southern Methodist University Student Newspapers, or its affiliates and/or partners are protected by copyright law under U.S. copyright and other international laws. All materials appearing on this web site are the property of the Southern Methodist University. You may not copy, reproduce, distribute, publish, display, perform, modify, create derivative works, transmit, or in any way exploit any such content, nor may you post nor distribute any part of this content over any network, including a local area network, sell or offer it for sale, or use such content to construct any kind of database. For more information, contact the SMU Archives at degolyer@smu.edu. For more information about the collection, please contact degolyer@smu.edu.